Hi everyone! 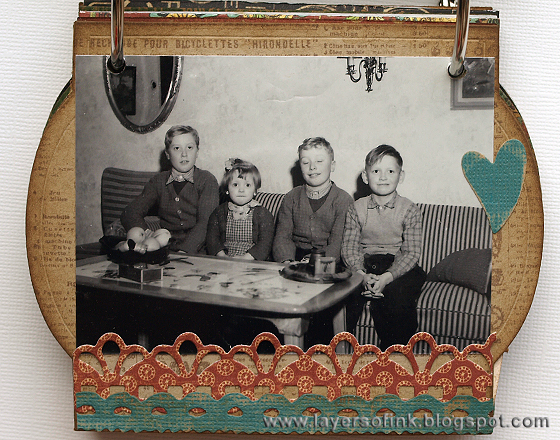 A new month starts tomorrow and a new challenge at Craft a Scene. During April our challenge theme is Down on the Farm or Ranch Scenes. 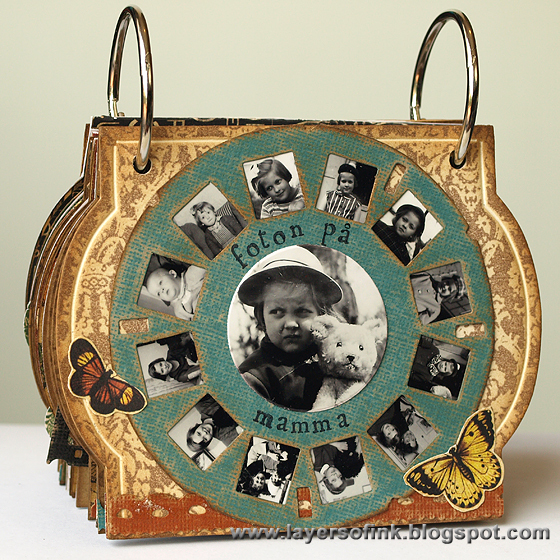 Great chance to use your old barn stamps, fences, cattle, horses, cowboys, etc. This is a half sheet scene done on glossy cardstock. 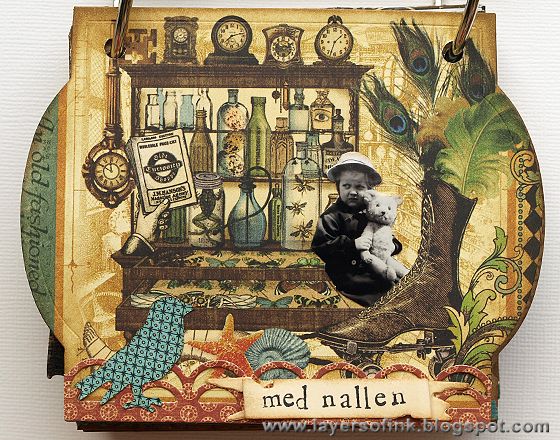 I started out with the new Stampscapes Old Barn stamp and then added other stamps to build a night farm scene. It ended up being a bit similar to a card I made last year, without me even realising it. All the stamping was done with Archival Jet Black Ink. I first applied yellow ink with a Colorbox Stylus tool, and then continued with the lighest shade of grey (Weather Vane) and adding darker and darker shades. The grassy areas were built with the Sedge Filler stamp and some stones. I love the Sedge Filler, it just magically creates a field of grass when you stamp it repeatedly. 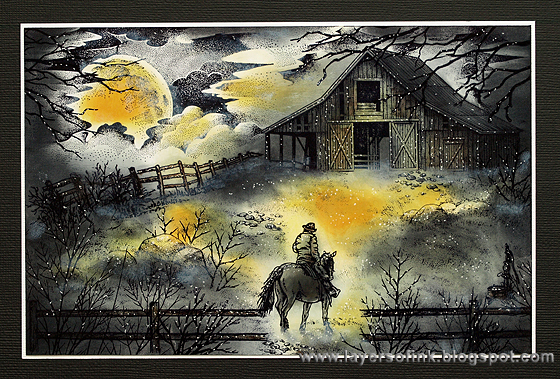 As usual, highlights were added with a white gel pen and mist and shine by dry-brushing white pigment ink on the scene. Thank you for looking! I hope you will join us during April! 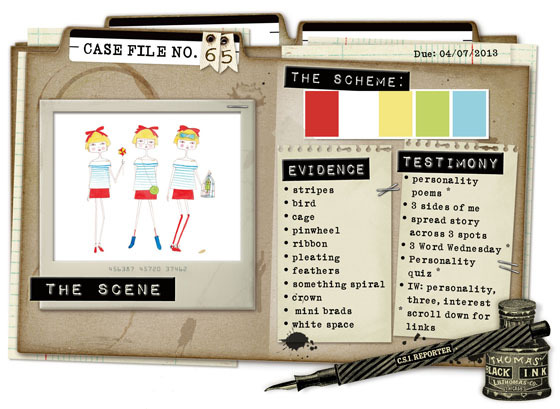 Today I am sharing my layout for this week's CSI: Color, Stories, Inspiration challenge. This is the last challenge of March. Sizzix has sponsored CSI during March and there is a prize to be won. 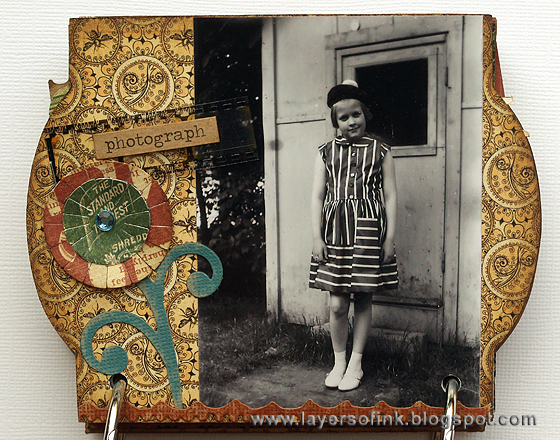 From the evidence I used: spirals, mini brads and ribbons. And from the testimony, I journaled about the three cousins' different personalities, each cousin got his or her own colour, number and journaling tag. It is hard getting all three of them in one photo, so I was happy about these photos. I used watercolour paper for the background and splattered watercolours on top to create a playful feeling. 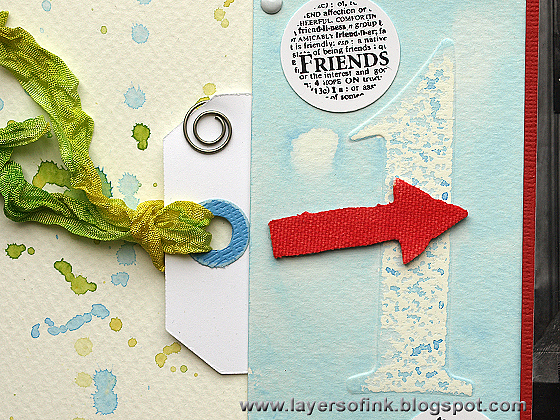 The numbers were made with Tim Holtz new Numbers Set Texture Trades and I used the wax crayon resist technique that I did a tutorial for recently. 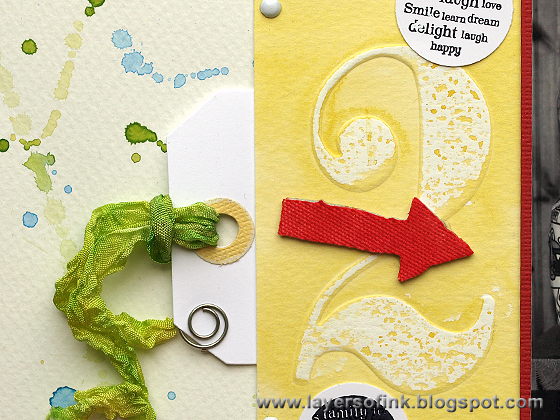 After embossing the numbers and applying the crayon, I painted them with watercolours, mixing the paints to match the colours of the case file palette. The arrows were die cut from grungeboard which had first been covered with sticky-back canvas, and coloured with Barn Door Distress Stain. 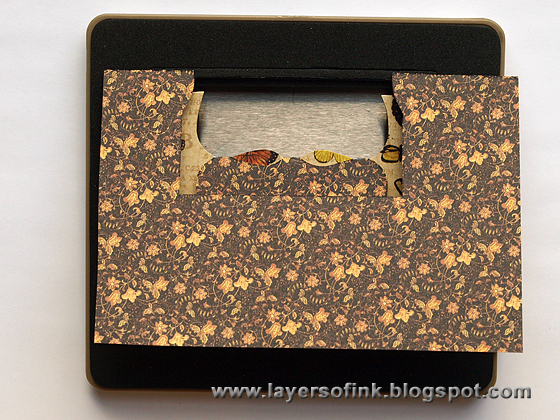 The crinkle ribbon was dyed with Mustard Seed and Mowed Lawn distress stain. 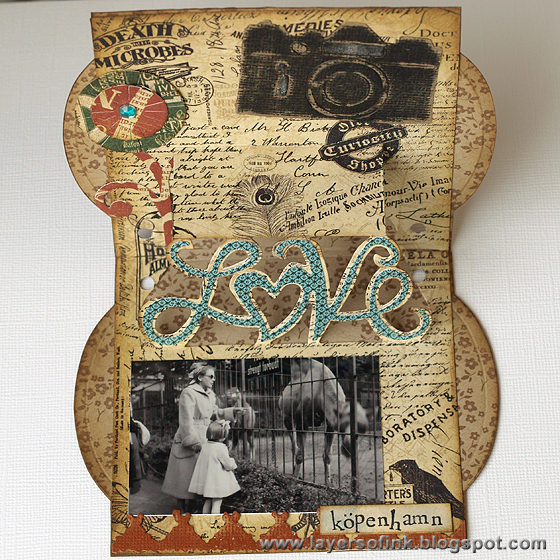 The little hearts were die cut from grungeboard covered with sticky-back canvas. My son coloured them with his favourite crayons. Thank you for looking! I hope you will join us this week! Hello! 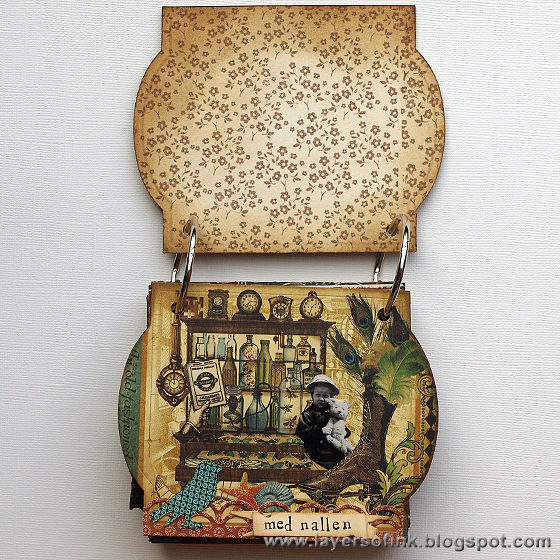 Today I am sharing a step-by-step Sizzix tutorial for a mini book with lots of pop-ups from Karen Burniston. 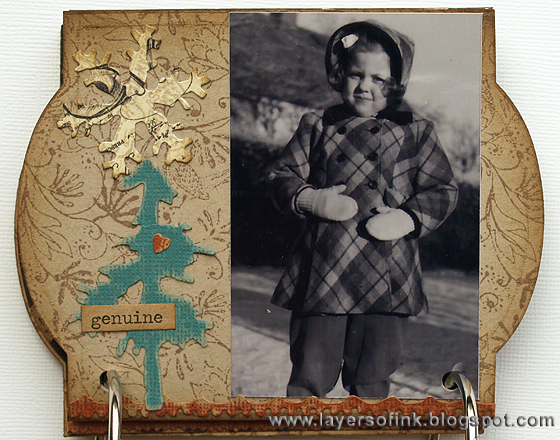 Pop-ups are such a fun interactive element to use in a mini book, and also make it possible to use more photos, and to hide little surprises here and there. 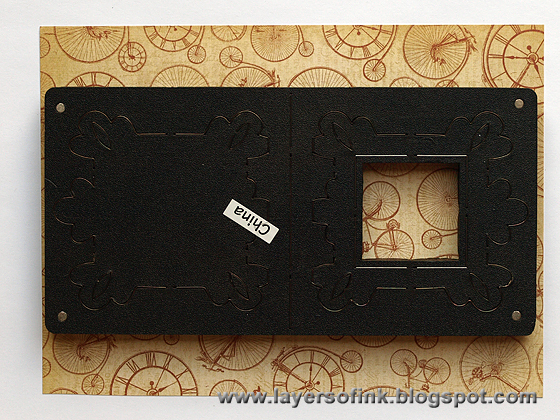 For the base I used Tim Holtz new Cameo Frame die. 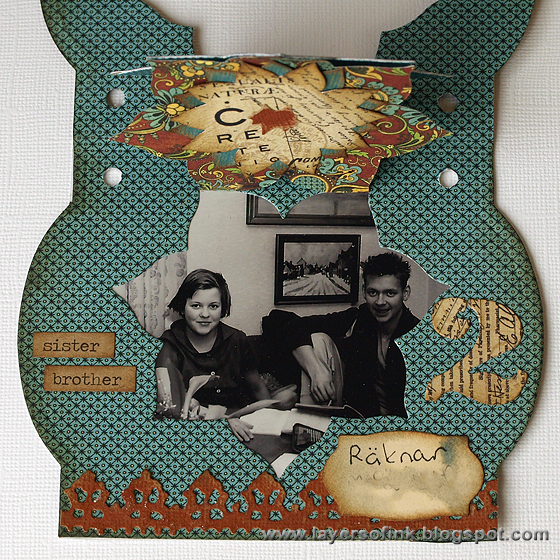 I love this shape with the two straight and the two curved edges (I used it on this altered notebook too). This is a very long post, the album got thicker than I planned and pop-ups often need more than one photo to show what they look like. 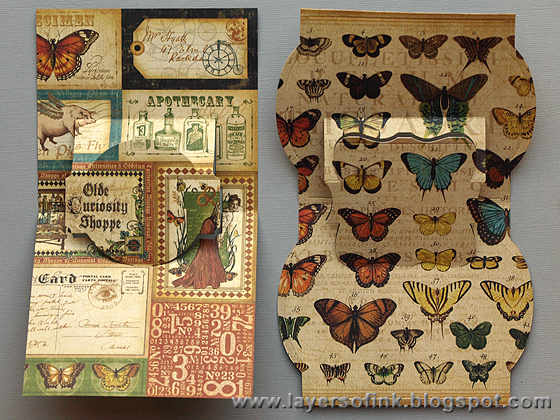 I must have used more dies than ever before in this mini book, they are all listed in the supply list. I wanted to show different examples by using different dies. Adapt it to work with the dies that you own. 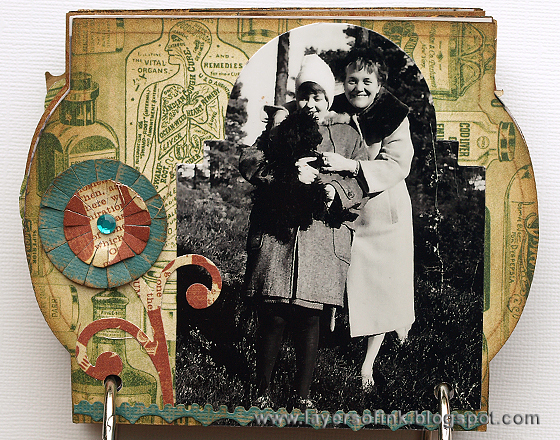 If you have only one pop-up die, use it throughout your album. 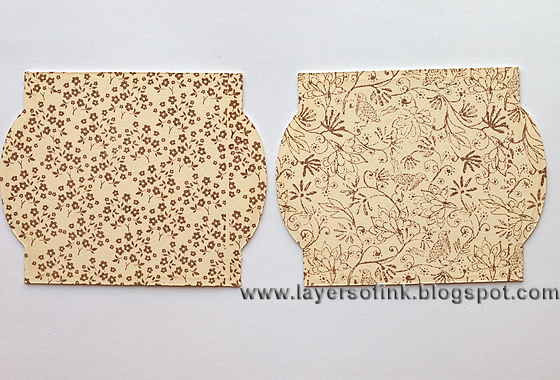 Die cut two covers from cream mat board. 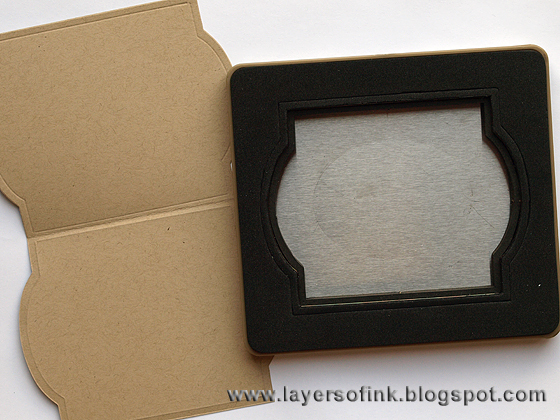 Since this die both cuts and makes a debossed score line around the frame, it works better if you use a crease pad when you cut it out, especially with thicker materials, otherwise the score line might cut through. 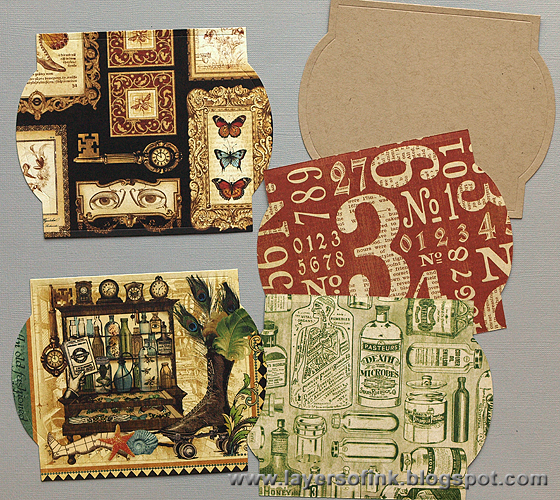 Stamp the covers with a Tim Holtz walllpaper stamp. 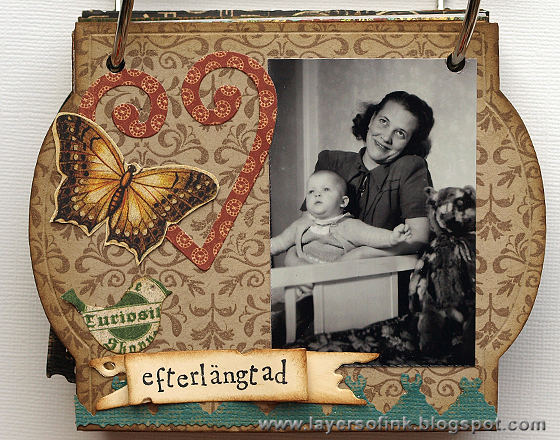 I used Versafine Vintage Sepia, but most inks will work. Mat board takes ink very well. 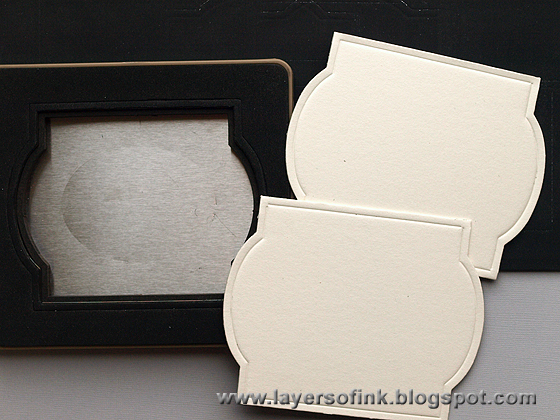 Stamp the inside covers with two background stamps. Ink the covers with Antique Linen and Gathered Twigs. I like how the inking emphasises the debossed line, since that one doesn't get inked. I knew I wanted to use Tim's new Picture Wheel on the front cover, and it fits perfectly together with the Cameo Frame. 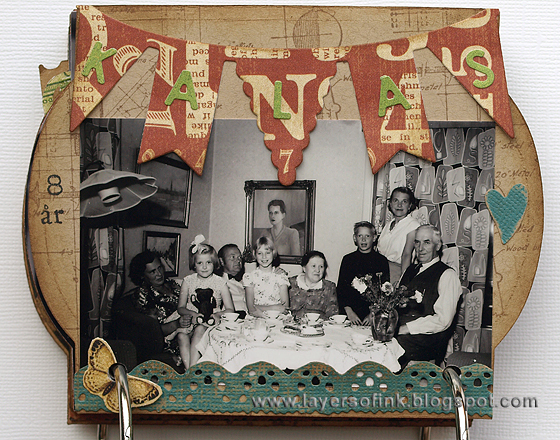 Die cut it from teal kraft-core cardstock, sand to reveal the kraft and ink. 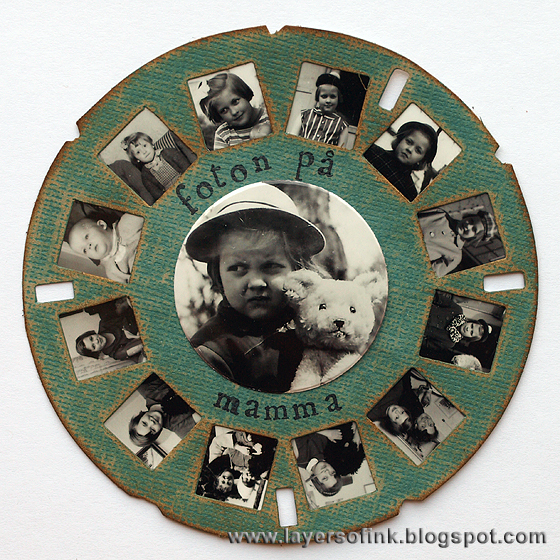 I had printed all the photos in different sizes and the smallest ones were perfect for the Picture Wheel. I picked 12 photos, cut them out and placed them in chronological order. 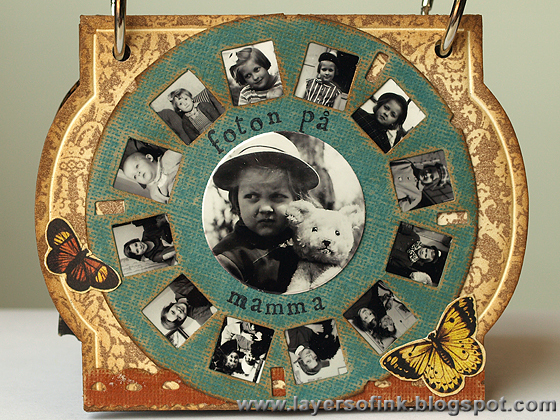 Using the Circle Framelits, I die cut a circle from a larger photo and placed it in the middle. The title of the album was stamped around the centre ('Photos of mom'). 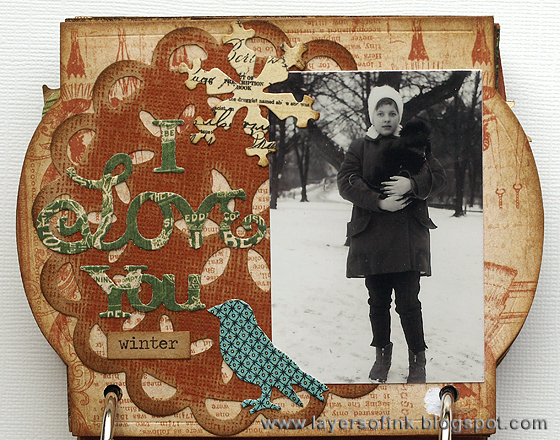 I used the gorgeous Graphic 45 Old Curiosity Shoppe for the album. The 8x8 pad was the perfect size and the papers are double-sided which was just what I needed. 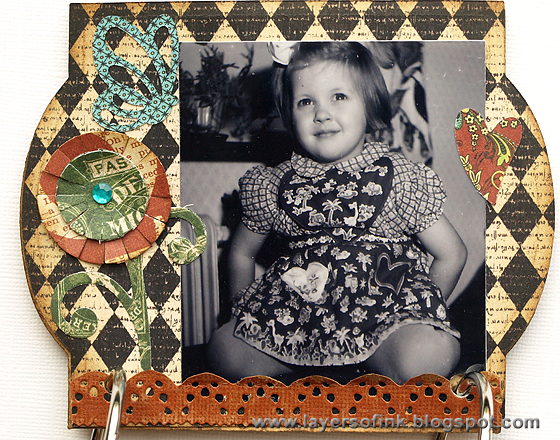 The patterns also worked real well together with my mom's childhood photos. 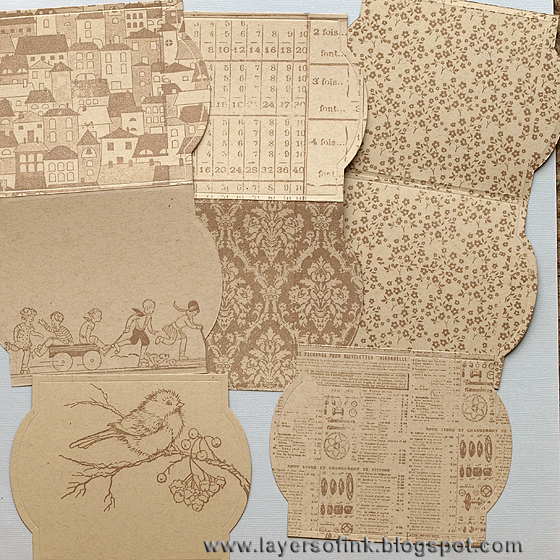 Die cut a bunch of pages from patterned paper and some from kraft cardstock (I think I die cut two from kraft). Time to make some pop-ups. 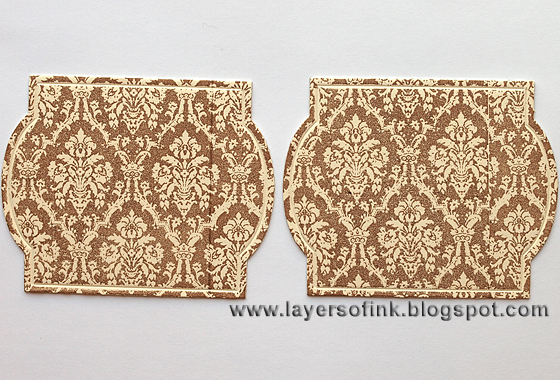 Cut a piece of patterned paper about 15x20 cm. 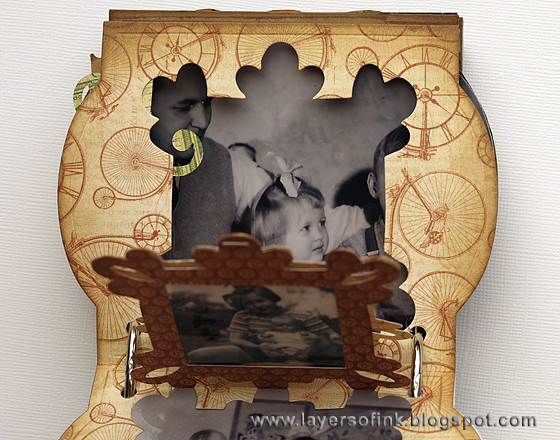 Place the Square Ornate 3-D Frame right in the middle of the paper. You want the fold line on the die to be in the middle of the paper. Carefully turn around, place in your base tray and die cut. 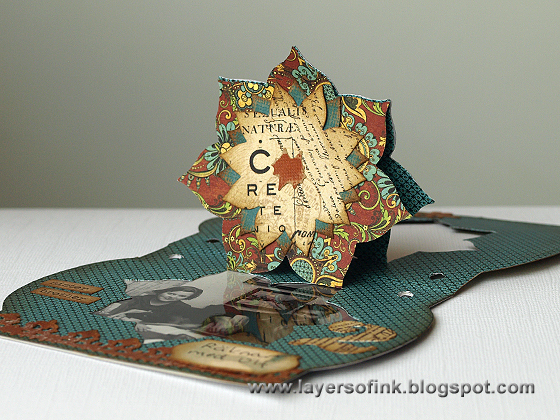 Fold your pop-up and place on the Cameo Frame die, making sure that the pop-up is in the middle of the Cameo Frame (that the distance to the edges is the same). Place the fold line just below the cutting line on the die. 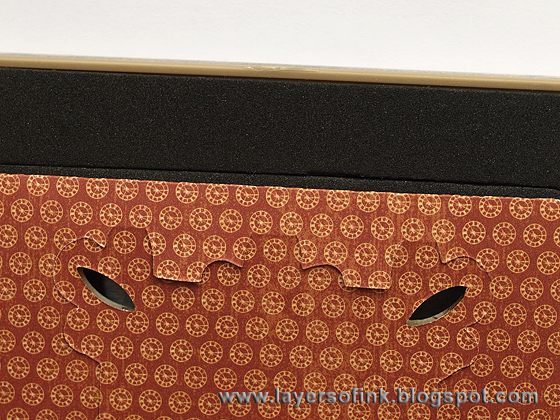 Here's a close-up where you can see better how the folded paper is placed just below the cutting line. 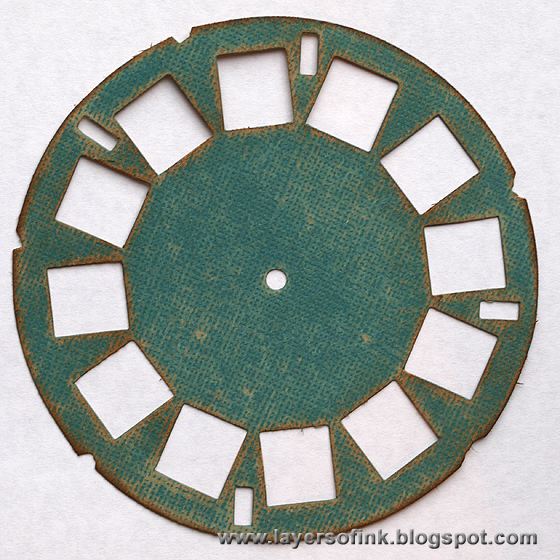 Then the die will not cut your paper where you want it to remain folded. Run it through your Big Shot or Vagabond. 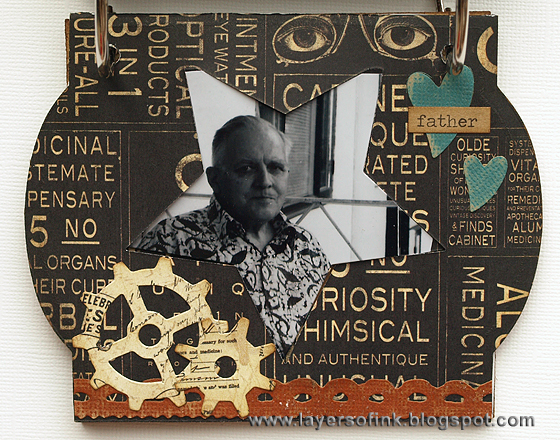 And like magic you end up with a folded Cameo Frame pop-up page. Do the same with the Star and Poinsettia Flower pop-ups. The Poinsettia die might seem to be a Christmas die, but the flower shape can be lots of other flowers, so it works for projects all through the year. 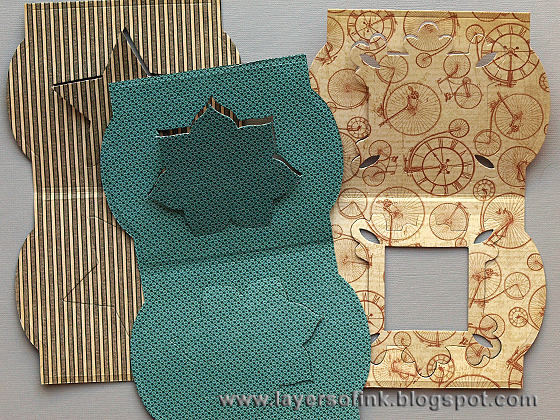 I didn't want every page to be patterned paper, so I also die cut some folded pages from kraft cardstock. 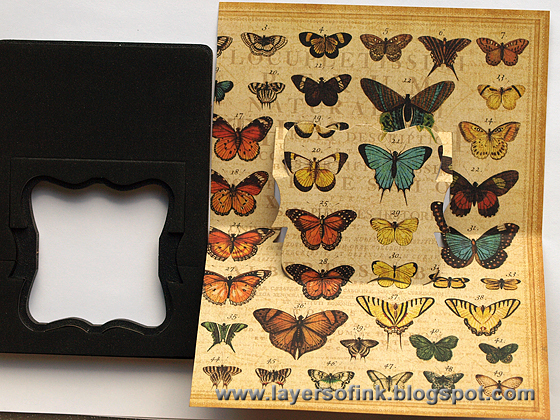 Cut another patterned paper about 15x20 cm and die cut with the 3-D Label pop-up. 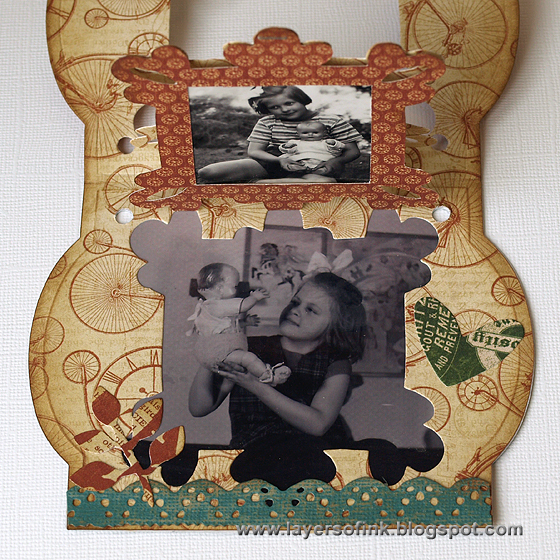 Fold as before, and die cut with the Cameo Frame. 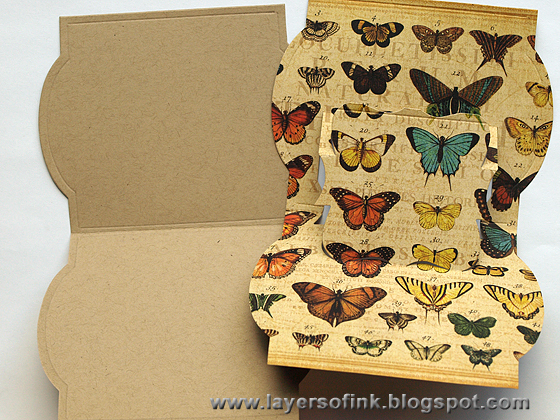 This pop up needs a backing paper, so cut another folded page from kraft paper. 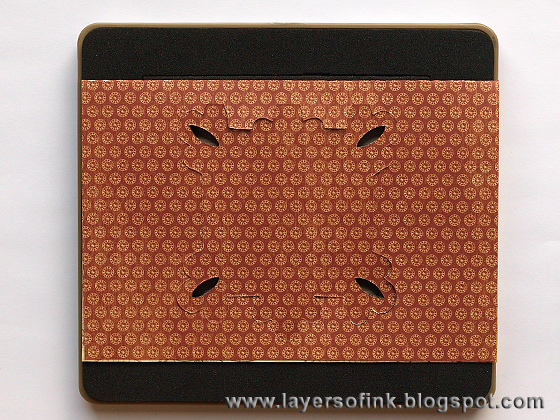 You need to trim the pop-up a bit around the edges, otherwise some edges will show. Die cut the Circle Label from another patterned paper. 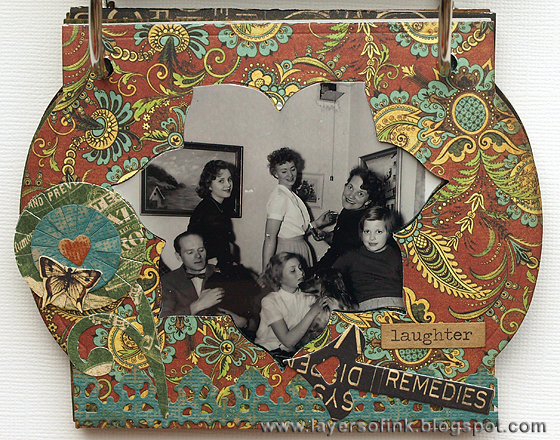 This time I didn't cut it with the Cameo Frame, but instead made it narrow enough to fit inside a kraft Cameo Frame page. 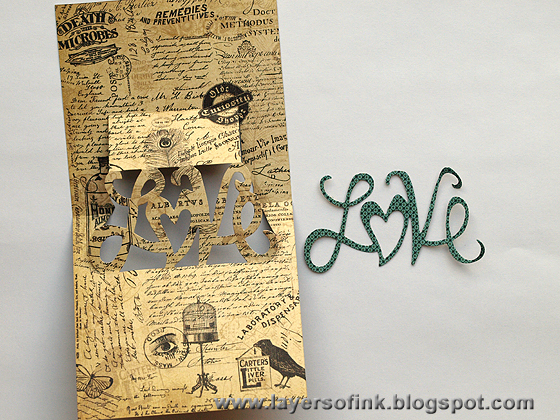 Die cut the Love 3-D Phrase pop-up from patterned paper and cut it narrow enough to fit inside a folded Cameo Frame page. Die cut the coordinating word using the Love Set. Stamp all the kraft folded and single pages back and front. I used different stamps that fit my project. Stamp the other side of the pages too, some I ended up covering almost completely. Ink all the edges of the pages in the book. 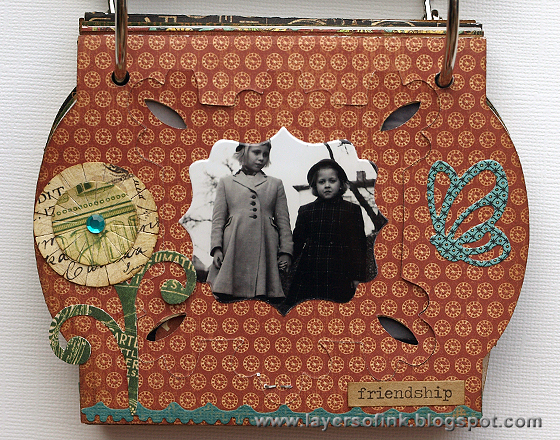 The front of the album with the Picture Wheel, Vintage Lace and butterflies. I wanted to keep the pages quite flat so that the album wouldn't be too bulky, since it is quite chunky anyway. 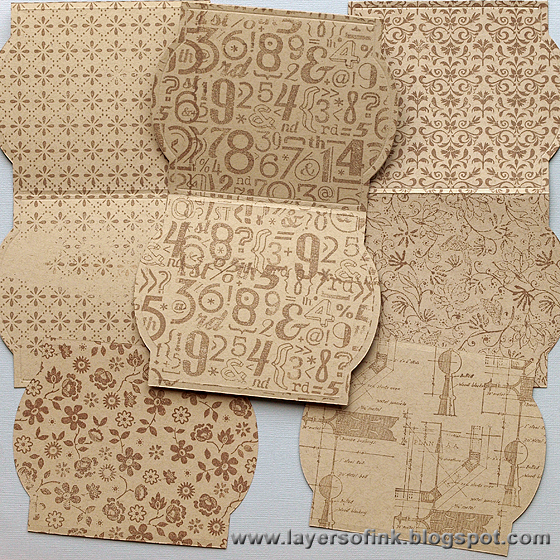 Most of the embellishments were die cut from kraft-core Core'dinations cardstock and from scraps of the patterned paper used for the pages. I liked the combination of the patterns and the kraft-core. Let's have a look at most (not all) of the pages. 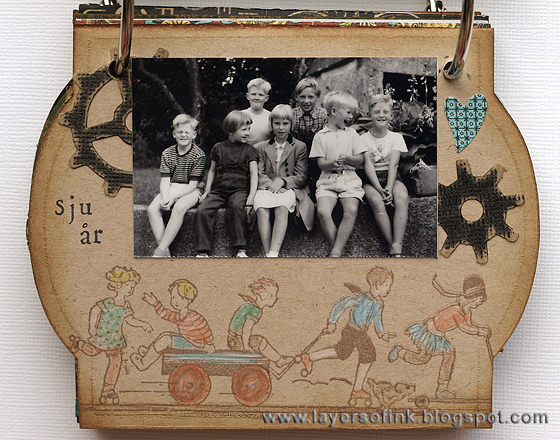 When all the pages were decorated, I punched holes and bound them with large rings. 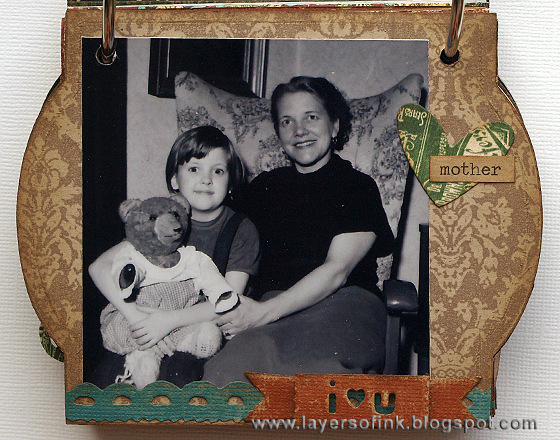 I cut out a small photo of my mom and placed her sitting on the shelf in the Curiosities Shoppe. 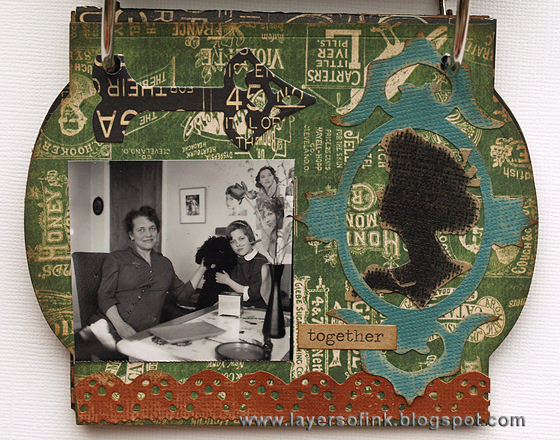 I used either the Thinlits Borders or a Vintage Lace at the bottom of most pages. 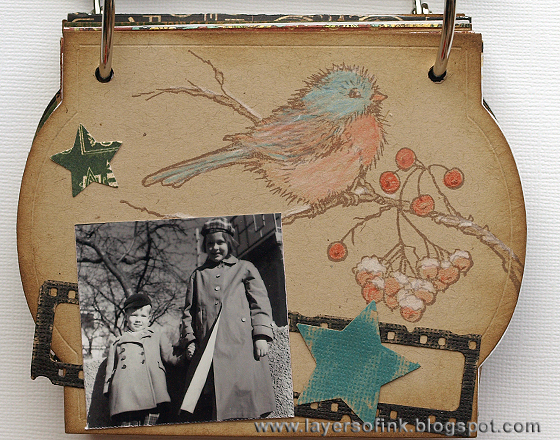 The photos are scanned from a photo album my mom made as a child, and I used her journaling on some of the pages. I will add more journaling and dates. 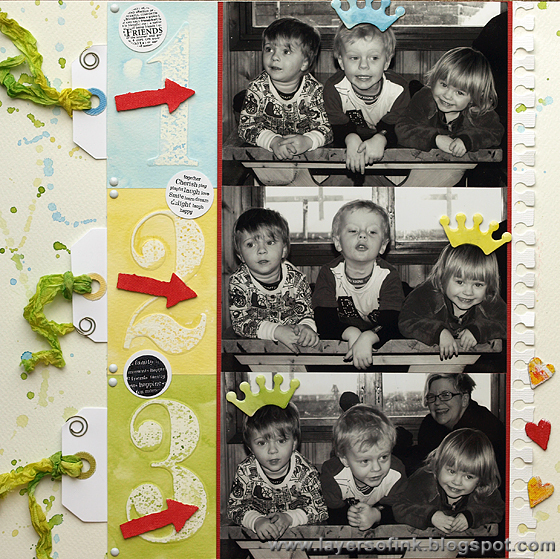 When you make an album like this one, make sure that you decorate the pages with the right side up, since they flip up, the back of each page needs to be 'upside down'. The flower is cut with the Sweet Treats for You die. The Love Phrase is one of my favourite word pop-ups. I used a Vintage Camera since my grandfather was an amateur photographer and developed his own photos at home in his darkroom. Love the look of sanded black Kraft-Core. The pop-up from the top. The photo is taken at the Copenhagen Zoo. ﻿A little pine tree with a tiny heart on top. The Stampendous Snow Bird was coloured with coloured pencils. 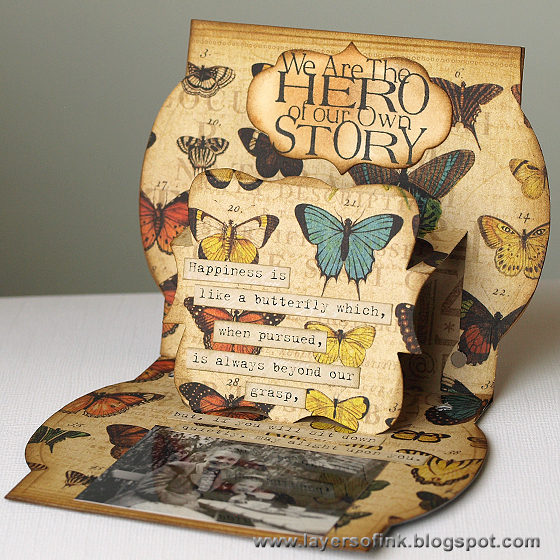 I used a favourite sentiment stamp from Stamper's Anonymous Classics #1 here and a quote about butterflies and happiness. 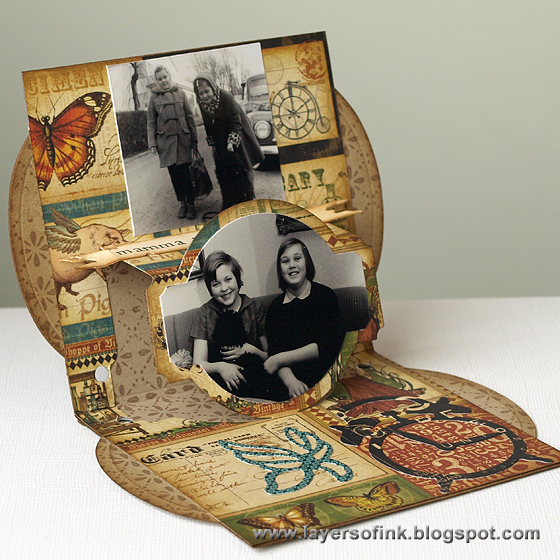 It is a lot of fun turning the pages in the mini book and coming up on the pop-ups. My mom, her brother and two friends. The Thinlits Banner fit perfectly at the top of this birthday party photo. My mom and a friend. 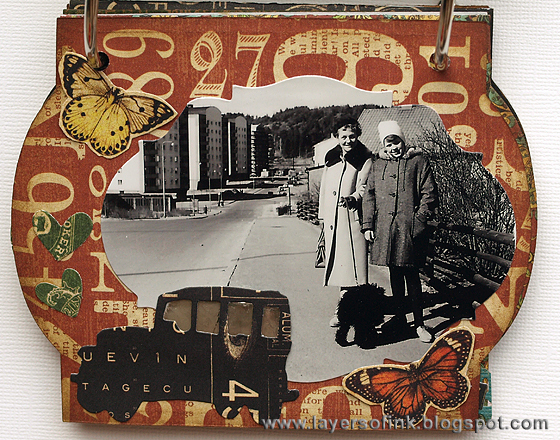 A Vintage Clock was placed on top of a number portion of the paper and I also used a pretty Thinlits butterfly. 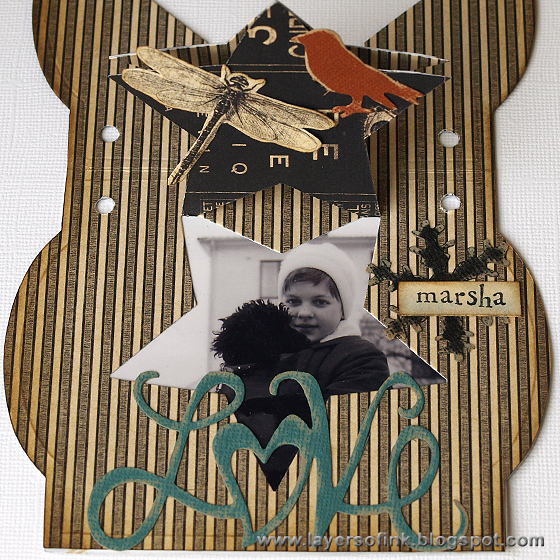 The photo was die cut with the label from the Love Set. The little bird comes from the Card Phrase #2 set. Another pop-up page. I like to leave these pages without placing them inside another one, so that you can see the pop-up from the front. If you remember my pop-up Christmas album, I did the same thing there. 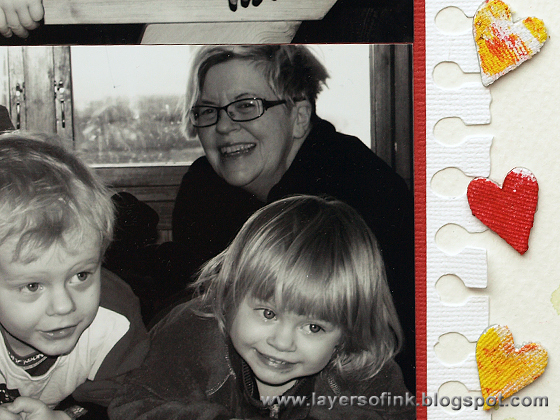 I chopped off a bit too much of my mom's friend's head when die cutting the photo. When you open these pages, you glance the page underneath through the negative pop-up shape. The inside, it opens real well when bound with the rings, but was easier to photograph on its own. I placed a photo underneath the second negative cut out. 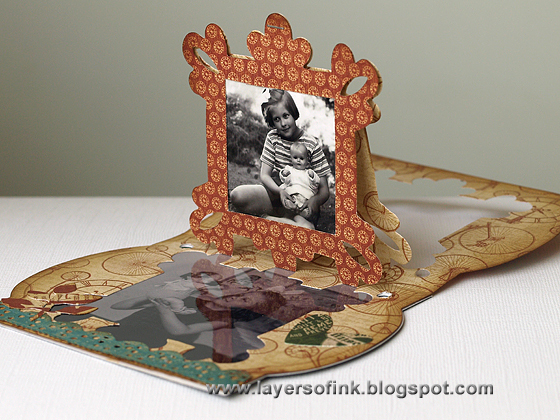 To hide the back of the photo underneath the pop-up, I die cut a large photo with the Cameo Frame. 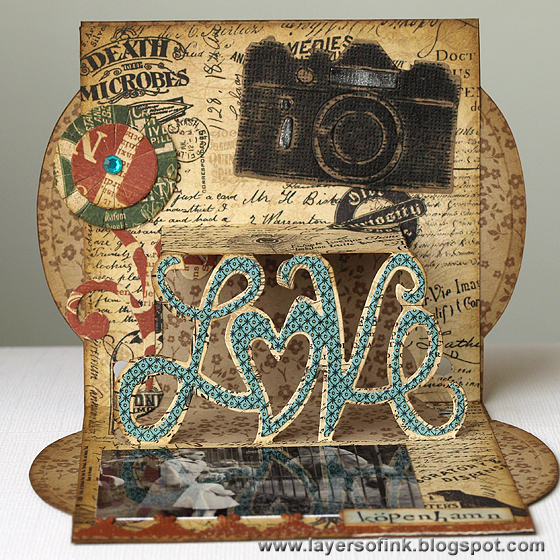 This photo was die cut with the Mini Baroque die and I placed a piece of mica behind the windows of the car. The doily was die cut from kraft-core, sanded and inked. The sentiment comes from Card Phrases #2. 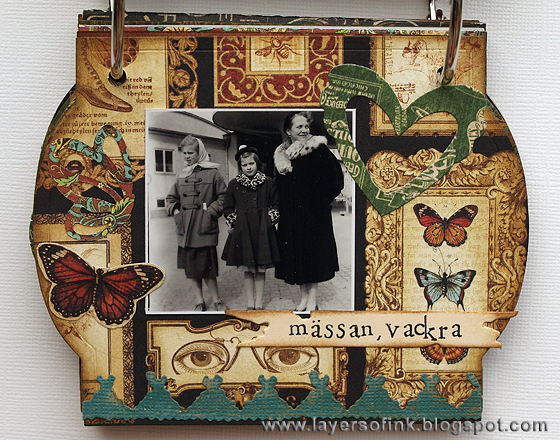 A very busy patterned paper, so I didn't add much, just a border, banner and some butterflies. 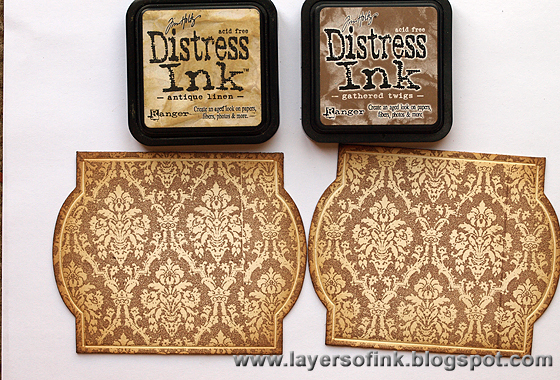 You get a lot of Vintage Lace from one just cutting the die once. 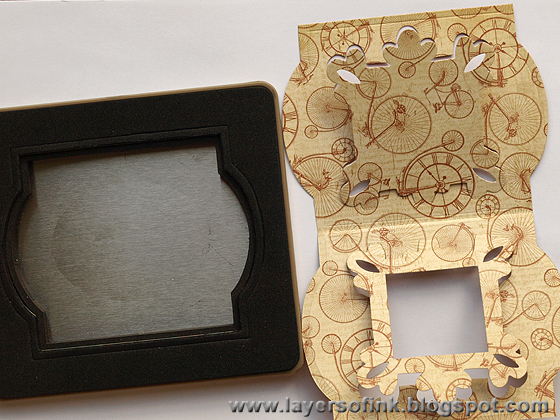 The Mini Silhouette fits perfectly inside the Fancy Frame, both die cut from kraft-core. 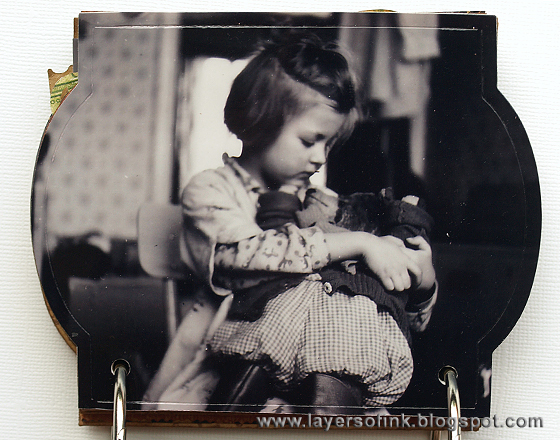 This photo was die cut with the Mini Cabinet Card die, to add some interest. The Poinsettia Flower pop-up. I used the pop-up die to die cut a photo that fits perfectly on top of the flower. I placed another photo underneath the negative space, which then also looks like a flower. The back of this page was covered with a large photo. There aren't as many photos of my grandfather, since he was the one holding the camera. I used the Star pop-up to die cut this photo and glued it on top of the star. When you open the last pop-up you find this. 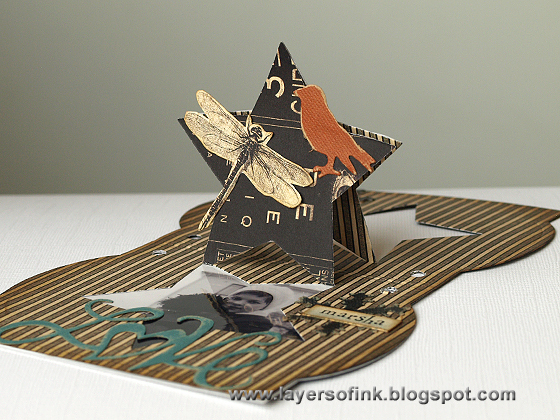 The dragonfly was cut from the patterned paper and the bird die cut from kraft-core. 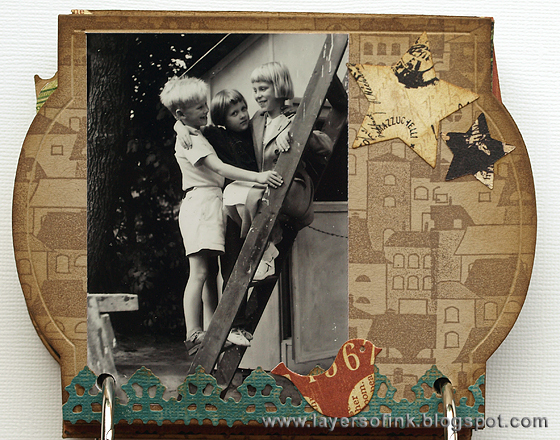 Again, a photo was placed underneath the negative star die cut and covered with a large photo at the back. The end! Thank you for looking at this very long post!